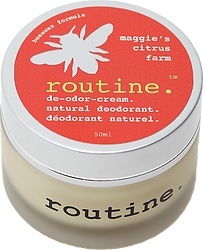 A beeswax formula that smells like eating orange popsicles while running through a sprinkler. Use a pea sized amount under each arm to stay fresh all day long. The 50ml pot is enough for 3-6 months supply, shelf life is 12 months after opening. Ingredients: cocos nucifera (coconut) oil, sodium bicarbonate (baking soda), zea mays (corn, non-gmo) starch, cera alba (canadian ethical beeswax), theobroma cacao (cocoa) seed butter, butyrospermum parkii (shea butter), calendula officinalis (marigold) infused olea europaea (olive) oil, tocopherol (vitamin e), flavor oil (organic lemon, grapefruit and citrus), citrus aurantium bergamia (bergamot) fruit oil citrus sinensis (sweet orange) oil, citrus medica limonum (lemon) peel oil, vanilla planifolia oil, myristica fragrans (nutmeg) oil.